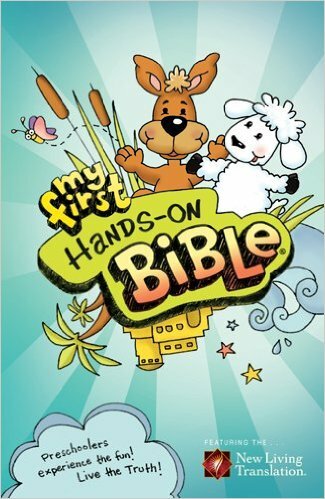 My First Hands-On Bible is the preschooler version of the popular Hands-On Bible, which has sold over a half million copies. Jesus taught with hands-on lessons and illustrations; My First Hands-On Bibleuses the same experience-based learning to communicate God’s Word in an active, understandable way. My First Hands-On Bible is a fun and simple yet meaningful way to engage preschool, pre-K, and K children (ages 3-6) with the Bible while helping them build a solid faith foundation. Each lesson focuses on a specific Bible point through a variety of activities in order to reinforce and help young children remember the stories and lessons. Using common household items, you can help your children have a “hands-on” learning experience while engaging them in 85 key stories from the Bible. My First Hands-On Bible doesn’t just retell the Bible stories; it also includes actual Scripture from the easy-to-understand and easy-to-read Holy Bible, New Living Translation. In addition to the stories and activities, there are fun illustrations, prayers, and a special Jesus Connection feature. I absolutely love this Bible! The stories are just the right length to keep my 4 & 5 year old interested and they have questions and activities to do during/after the story, a "Jesus connection" and a short prayer. We have another Bible and lots of Bible story books, but my girls love this Bible and it is now a part of our bedtime routine! They are practically begging to go to bed so we can read. This is the perfect Bible for little ones, if you are looking for a Bible for your child(ren)...look no further! I suggest all parents/grandparents etc check this Bible out. It would also be perfect for a church nursery/preschool class.